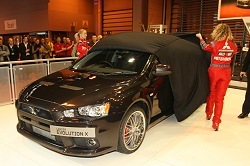 If you're a motorsport fan you need to be up at the NEC in Birmingham this weekend, as the Autosport Show is in town. Aspiring racers, car nuts, dreamers and motorsport fans will have an interesting diversion from the rain this weekend at the Autosport Show. The event, which brings virtually every discipline of motorsport under the roof of the NEC's massive halls opened its doors on the 10th, and runs over the weekend. Running alongside the Autosport event is the PistonHeads show, so if you want to go and drool on everything from Ferrari Enzos to Koenigseggs then it's well worth a visit. The motorsport element of the event remains the biggest draw, every discipline represented from karting to Formula One with some rallying, hillclimbing and Formula Student thrown in for good measure. The show also has some firsts, Aston Martin showing its DBR9 GT1 racer in iconic Gulf pastel blue and orange livery. The combination of Aston Martin and Gulf colours is certain to ensure this year's Le Mans 24-hour race crowd is awash in the classic colour scheme. 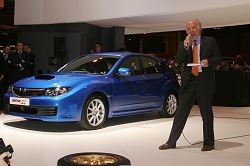 On the same Prodrive stand Subaru's STI Impreza gets its first UK airing, the £24,995 asking price undercutting its closest Mitsubishi Evo X rival. That car too makes its UK debut at the show, ensuring Autosport International is a must-attend show if you're a Japanese performance car fan. Other notable announcements include SEAT's decision to race its Leon racer in the British Touring Car Championship in diesel guise, its two cars being driven by Darren Turner and Jason Plato. Ferrari's new GT2 contender is on show on the CR Scuderia stand, the new team unveiling its new sponsor Sky on the racecar, its FIA GT2 and British GT3 Ferrari 430s and Formula Renault cars exhibited in the new team colours and sponsor's liveries on its stand. Other highlights at the show include the Live Acton Arena, where there'll be demonstrations by of some of the show's most exciting cars and drivers. 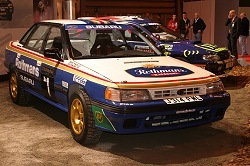 A historic touring car exhibit, a Colin McRae memorial stand featuring cars from throughout his phenomenal career and an F1 paddock line-up are also stand-out exhibits at the event. Plenty of big name drivers such as David Coulthard, Jenson Button, Allan McNish, and Andy Priaulx will be in attendance, and taking part in autograph signing sessions - the event an excellent opportunity to meet motorsports stars, and ogle at the machines that they're lucky enough to drive. 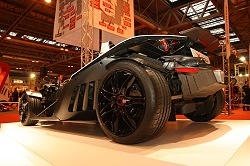 The Autosport International show takes place at Birmingham's NEC from 10-13 January.